Did I mention that this is my first ever blog? Yup. I am a noob. But hey, you need to start somewhere right? So, I was writing my earlier post and I realized how hard it is to complete an entry using just my mobile phone. The thing is, I'm barely on a PC/Laptop except at work. I wish I could login my Blogspot in our office network. Promise, all my post will be GP Rating. Between work, Mila and milkmonsterstore (more about this in future posts), it's really hard to find uninterrupted time for me. And Mila is so darn attracted to the keyboard, I doubt she'll let me type a single word before taking over. Hence the search for an app to use on my mobile. So I can get my thoughts out while Mila is clinging on my breast. Or when one arm is immobile because it serves as her pillow. Blogger already has it's official app. It's not available in the Philippines though. Boo! Google Play search gave me Bloggeroid for Android. I am trying it out right now. This is a lot easy than when I was using my mobile's browser. One thing lacking is an easy editing feature. I' do have to brush up on my HTML codes and this may work for me. I'd give this a few more tests soon. Can you please share if there's another app you're using? UPDATE: I now have the official BLOGGER app on my phone, thanks to +Coffee and Android. 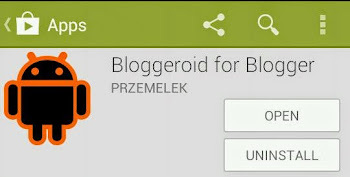 I still prefer to use Bloggeroid because I find it easier to manage. Just to be fair, I only used Blogger for a day and I've been using Bloggeroid for a few weeks now. Maybe I'll give it another shot. I never knew there was Blogger app, probably because I never bothered searching LOL. Will download it now! I hope you find it useful. At least when you're mobile and a good blog post comes to mind. I downloaded this apps before but I still prefer creating a post in my laptop. I agree. If I have the chance to sit down and work, I still prefer a PC. It gives more control on editing. It does help to blog on the smartphone, especially when my photos are from my phone. I upload it using the blogging app and then, finetune the post on my laptop. Although, I use Wordpress, I am looking for a smartphone I can use for easier blogging, especially, when I am out of the house. I'm using laptop and heavy to carry everywhere. Now I know, thanks for sharing! WordPress also has their own Android App. I hope you find it useful too. 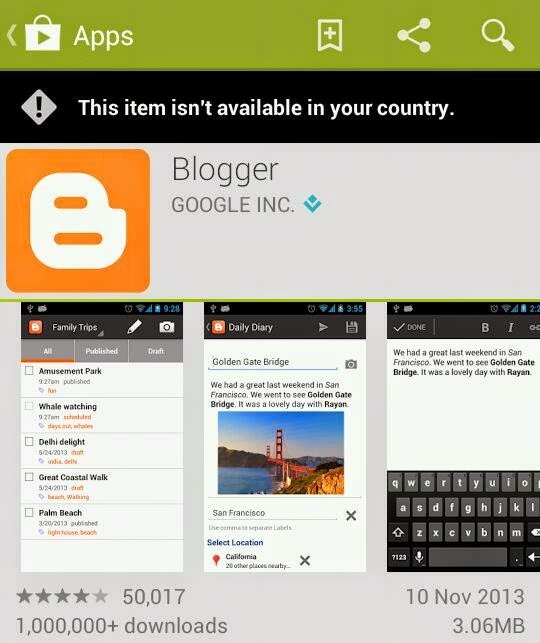 I tried downloading a Blogger app before, but like what you said, it's unavailable in the country. How did you download yours? I'd love to know because I draft my posts in my phone! Can you comment your email so I can send you the installer? Wow, blogging through phone. That's quite a technology. Goodluck to your blog and hope to read more about you in the future. I prefer blogging on the desktop, though, since I am nearsighted, hahahaha ( old and you know the drill), I want my words screaming at me, while blogging, so a small screen would be a challenge for me.But yes, with this fast paced world we are in, this is something of a convenience. Thanks for sharing this, I will bear this in mind. Apps indeed make life easier! If there's no app, I type my thoughts on notes and email and post in a blog in a later time. I tried to download the Blogger app for Android, but I prefer blogging on the desktop. Will try to use it this weekend kasi I'm so late na on my blogposts. i might try downloading this too. is it easy to use lang? kasi whenever i try blogging in my mobile - it takes me thrice as much time versus the desktop. PC is much better when it comes to blogging. I hate how when you upload some photos in the media, its lagging. Though the only pros when you use an app is of course the mobility it gives. The blogger app is useful, especially when you're in the mood to write and the pictures are saved on your phone. It would save your time since don't have to transfer it to your PC, but of course it is much easier if you use your computer. Haven't tried this app yet. Thank you for sharing! I have blogger app but only on iPad. But of course I rarely use it because I prefer to type on a keyboard. But I have to agree with you having a kid while blogging is such a hardwork. Goodluck! For me, I find it hard to blog on mobile, but, yes, like you, time is an issue, I'll give this a try! I use Wordpress and while I have the app on my phone, I only use it for replying to comments or reading posts from my feed. Unfortunately, my poor phone crashes. Haha. I love doing my work on a laptop/desktop. I sometimes check out my blog in the office, it's much easier and I don't have mobile internet anyway. Hahaha. I also use the Blogger app for iPhone and I did install bloggeroid on my tablet however I think I got used to using the iPhone app. I too am a mobile phone blogger hehe. I'm on wordpress but I'm gonna check on this, thanks for sharing ! Wordpress blogging belle here! I have the Wordpress app in my phone and tablet. I have tried posting on my blog using my tablet but never with my phone. Super liit! Sometimes I write the outlines of my posts on the notes app of my phone especially when I am in the train. Looking forward to your future blog posts. Enjoy blogging sis! I only got my first ever smart phone 3 days ago, and I wish I can use it to blog too. I am still getting used to it pa, so I only have few apps installed. Personally I haven't tried this yet but its good to know there is such an option. Honestly, I find it hard to blog using my smartphone. But, I think I have to learn the ropes on how to do it. I don't even attempt to blog on my phone. It's too complicated. haha... So I really have to set time to set up my laptop to do it.